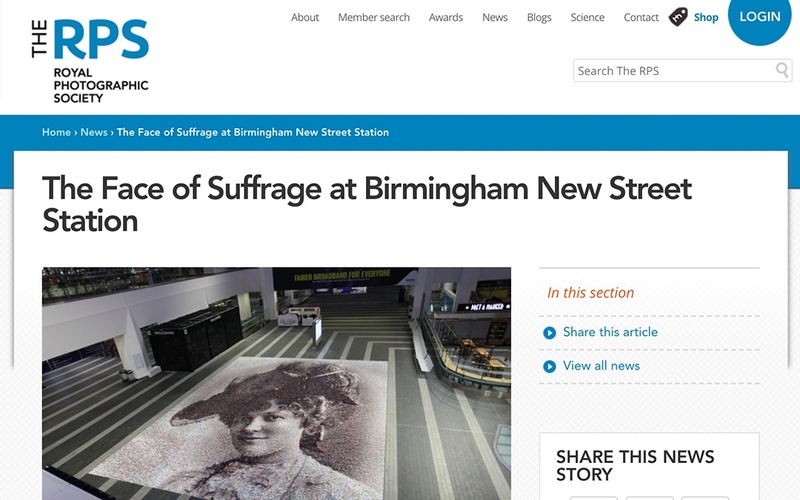 ‘The Face of Suffrage’, at Birmingham New Street, is a floor-based 200 metre-square photo mosaic revealing the face of a Suffragette with a ‘daring and brave’ story to tell. It is made up of more than 3,700 photos of women and girls submitted by the public, combined with hundreds of historical images from the early 1900’s. The artwork commemorates 100 years of the women’s vote from across the West Midlands and beyond. The portrait is of Hilda Burkitt (1876-1955) the first Suffragette to be forcibly fed a total of 292 times. She worked at the Birmingham Women’s Social and Political Union in Ethel Street (near New Street station). Hilda threw a stone at Prime Minister Asquith’s train as it pulled out of the station and she was incarcerated at Winson Green Prison.